How is mars out of sect? I thought planetary sect was determine if the planet is above or below the descendant. such as in a day chart if mars is below the asc/dsc it is in nocturnal sect. But here it seems to be out of sect. Can someone tell me how to properly tell when a planet is in or out of sect? To me it seems something to do with 4th - 9th houses playing a role in if the planet is out of sect once it is determine if it's a diurnal or nocturnal chart. Help!!! me understand why mars is out of sect in this chart. Hi there - there are a number of sect conditions in traditional astrology. The most important one is the overall sect of the chart. Burroughs was born in the day so this is a diurnal chart. Mars is out of sect in the most important way because it is a nocturnal planet in a diurnal chart. However, you are right that Mars fulfils other sect conditions. It is in the nocturnal hemisphere, being below the horizon in a diurnal chart. It is also a nocturnal planet in a nocturnal sign. There are two different views of the sect condition of Mars in signs - in the earlier Hellenistic tradition, Mars was considered in sect in a nocturnal sign (earth or water). However, in the later Medieval tradition, Mars was considered in sect in diurnal signs (air or fire). The table below is taken from Planetdance, Jean Cremer's freeware. It shows the sect conditions of all the planets. In this case Mars is shown in sect in a nocturnal sign. Two planets fulfill all the conditions of sect: Sun and Jupiter. Both are diurnal planets in a diurnal chart, in diurnal signs and in the diurnal hemisphere. This is known as the condition of hayz in the medieval tradition. "...the motions that are akin to the divine in us are the thoughts and revolutions of the universe." Both are diurnal planets in a diurnal chart, in diurnal signs and in the diurnal hemisphere. This is known as the condition of hayz. Thank you so much for the response! So it seems in this case the author is working with the thought pattern of Mars is not in a nocturnal chart, but in a diurnal chart. If a planet can be in sect because of sign, placement, and the chart being noct/diurnal. When is it appropriate to use the other forms of sect determining (sign & placement)? Should I always consider Moon, Venus, Mars to not be in favor of a diurnal person/chart? And assume these planets will always be an issue for the person in some form. The author does state "I want to make clear that I am using sect in the earlier, simpler meaning term, referring only to whether a chart of day or night, and whether the planet is in or out of the overall sect of the chart." I didn't understand what he meant until you spoke of "The most important one is the overall sect of the chart." Appreciate any further information you have time to share with me. Hi - I'm glad the post was helpful. Sect is an interesting way of looking at the quality of the planets. However, most unfortunately, the method seems to be lost to modern astrology. 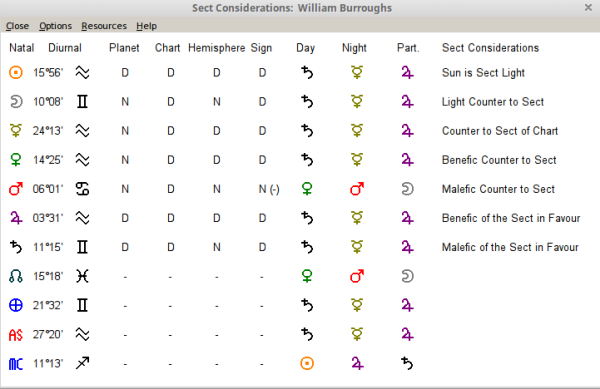 In Burroughs' case, in the Greek tradition, that Mars is a nocturnal planet in a nocturnal sign tempers the fact that it is out of sect with the chart as a whole. However, in the medieval tradition, Mars being in a nocturnal sign as a masculine planet compounds its discomfort. Masculine (yang) energy is associated with the day rather than the night. Of course, Mars is also in fall in Cancer, so it is a tricky position. Mercury is slightly different - if it is rising ahead of the Sun (oriental) it is considered to be diurnal; if it is setting behind the Sun (occidental) it is considered to be nocturnal. Hence the placement of Mercury in relation to the Sun changes its sect. 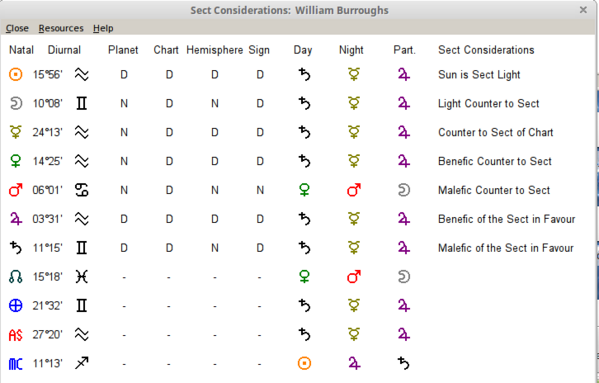 In Burroughs' chart Mercury is nocturnal. Moon, Venus and Mars are intrinsically nocturnal. Sun, Jupiter and Saturn are intrinsically diurnal. I think you have to evaluate the overall condition of the planet taking sect and dignity into account. I would always take account of the sect condition of Mars and Saturn, being the malefic planets. According to the tradition, Mars in a day chart will generally be the most difficult planet in the chart because it is a nocturnal planet and is more 'manageable' in a cooler night chart, all other things being equal. The heat and dryness of the day 'agitates' an already hot dry Mars. In a night chart, Saturn may well be challenging, being the malefic out of sect, because its coldness is amplified in the cool of the night. Both are somewhat tempered by the moisture of a night chart, as both are dry planets. By the way, I've just updated the sect module in Planetdance so it shows both traditions, Greek and Medieval, in relation to the sect of Mars. Thanks for the response. So I can consider the sect through sign and placement to see if it alleviates some of the negative a planet whose out of sect by overall chart. Just I have to decide which method of out of sect by sign I use, either Greek or Medieval. I can see the reasoning for greek astrologer's method of out of sect by sign. I can really see both reasoning for method. I'll try some of the out of sect by sign greek astrologer method. The masculine/feminine qualities doesn't really hold too much sway with me since I don't naturally think of traits as feminine/masculine. Thanks - yes, it's best to experiment. I still haven't made my mind up. I take your point on gender. It comes through the tradition, but may be it's out of date now! I tend to think of the qualities as yang or yin, active or receptive. This takes away the gender question, since we can be both active or receptive in different parts of our natures, whichever 'gender' we might be. Just for completeness - in Burroughs' case, Mercury and Venus meet the criteria for being 'ex conditione' in terms of sect. Both are nocturnal planets, but they are in a diurnal chart, sign and hemisphere. This term was coined by Rob Hand in his book Night and Day. This situation is the opposite of hayz. We can see, using sect, that all Burroughs' personal planets - Mercury, Venus and Mars, are 'challenged'. The idea specifically for Mars is that in a day chart that increases its excessive heat and renders it more malefic and potentially destructive to whatever it influences, whereas the cold of night tempers it and keeps it better regulated. You can have a day chart with Mars under the earth and in a feminine sign and then it can be called Hayz, which is more positive than if it were above the earth because it is away from the Sun. Saturn is the opposite. It is malefic due to excess cold, so in the day it is more positive and at night it is more malefic. Sorry for delay response..saw your response but was half asleep. Looks like all those planets are out of sect by sign, placement, and chart. Jupiter does seem to be his strongest planet sect wise. Jupiter is MC lord...so might have herald good. His writing and career was around 12th house matters...his first major book was about his imprisonment. 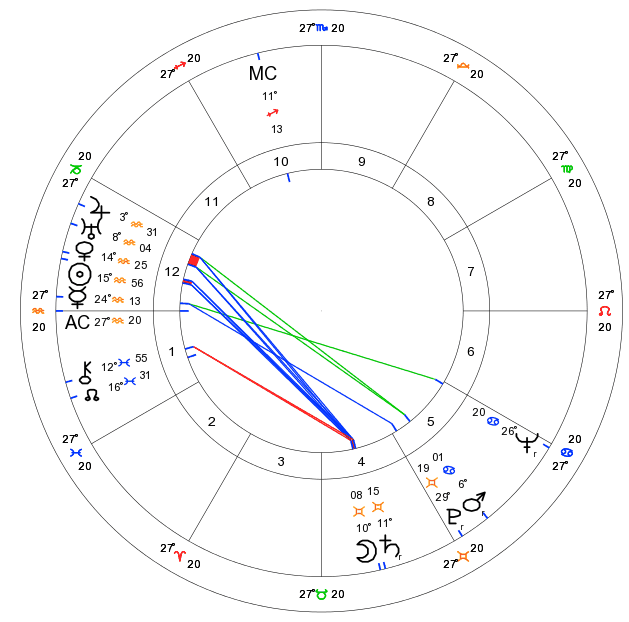 What wuld it mean if a -3 out of sect planet (sign, placement, chart) and +3 in sect planet (sign placement, chart) conjunct, would they both help and hinder one another? AH! Thank you for explaining this.